As you can see, the Layout Objects window is separate from the Inspector window meaning that it will stay put while you're working in your layout. You can reduce visual clutter by hiding all other objects, or hiding objects in front of this object, or any other objects colliding with it. I know all of us who have watched our blood pressure spike trying to fix a highlight row on a portal will breathe a sigh of relief. There is also the ability to specify the object's name, meaning that the object name property does not have to be neglected in the name of expedience any longer. Layout objects are listed with an icon to tell you what sort of layout object it is, and with a quick filter and find button to pare down your layout object window, a task like "adding conditional formatting to all buttons on a massive layout" goes from being a monumental task to a simple walkthrough list. 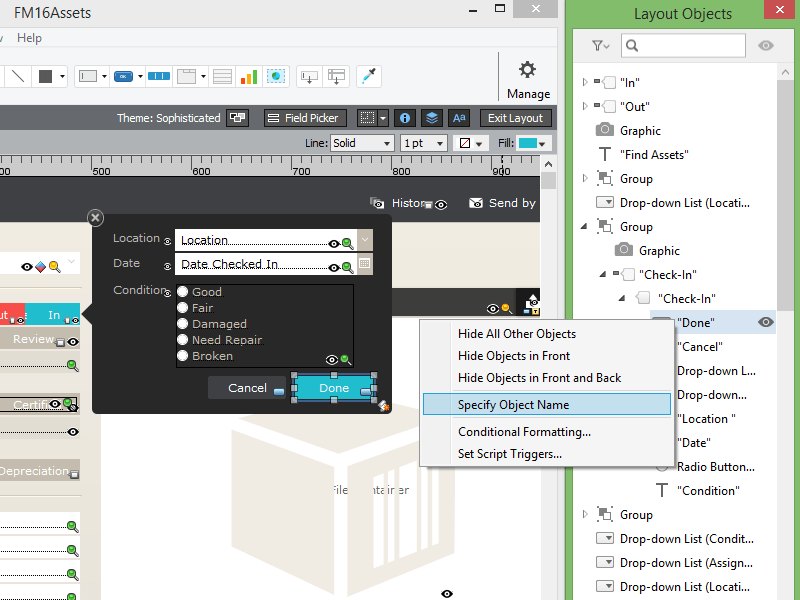 With the ability to expand and collapse groups, the Layout Objects window is a powerful tool in managing complex layouts. 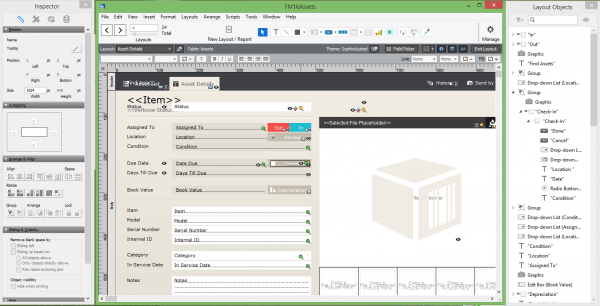 Prior to FileMaker 16, managing your layout objects was generally a matter of good memory and a little luck. Apart from the occasional ‘Go To Object’ script step to take the user to a specific tab or panel field as part of a scripted process, or scraping the data out of a web viewer, most developers would neglect the Object Name property on a layout object. Selecting an embedded object, particularly one that was behind another, or hidden with clear borders and fill, can be an exercise in frustration. However, with the new Layout Objects Window in FileMaker, developers can now quickly and easily query a layout's object—including objects that are wrapped into a grouped object!